Spanish tennis legend Rafael Nadal will start the season as world No. 1 after adding two more Grand Slam titles to his tally in 2017. The 31-year-old Spanish star lifted the French and US Open titles to become the oldest man to top the end-of-year ATP rankings. Nadal was in commanding form throughout the past 12 months despite dealing with a serious wrist injury and for 2018 he shows no signs of slowing down. He will open the year at the Brisbane International (January 1-7), which he will likely use as a warm-up for the Australian Open (January 15-28). He might choose to spend the end of February in Mexico, playing in sunny Acapulco (February 26-March 3). In March he will likely play the 2018 Indian Wells (March 6-March 18) and then make the trip down to Miami (March 22-April 2) afterward, where he lost to Federer in the final last year. 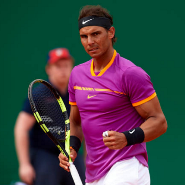 In April he will play in the Monte-Carlo Masters (April 14-22) followed by a trip to Barcelona (April 21-29) to defend the title he has won 10 times before. In May he will stay in his native country to attend the Madrid Open (May 4-May 13), which he will follow with a trip to Rome for his third clay Masters event of the season: the Italian Open (May 14-May 20). Then he closes the month heading to Paris to play for his 11 Roland Garros (May 27-June 10). If he’s healthy in late June Nadal will play the Stuttgart Open (June 11-17) and then play the Queen’s Championship (June 18-June 24) in west London. In July Nadal will try to be completely healthy for Wimbledon (July 2-July 15) before heading to Canada in August. He will visit Toronto (August 6-August 12) before heading to the U.S to play a week later in Cincinnati (August 13-August 19). He will stay in America to try to defend his 2017 US Open title (August 27-September 9). In late-September he will probably head to Chicago to take part in the second edition of the Laver Cup. Then Nadal is likely to head to Asia, where he’ll play the China Open (October 1-7) in Beijing, before taking part in the Shanghai Masters (October 8-14). Nadal has rarely missed the Swiss Indoors (October 22-28) in Basel, Roger Federer’s home tournament and will probably be there this year once again if he’s healthy. That is followed by the Paris Masters (October 29-November 4) where the world rankings will be the main focus. To close the season successfully, Nadal will hope to have qualified and remained fit enough to play in the ATP World Tour Finals (November 11-18).